John Deere is exhibiting two new 5R and 6R Series tractors and a brand new Gator utility vehicle for the first time at AgriScot 2017 (stand no. 187 in the Lowland Hall) alongside the latest developments in farm connectivity, with the focus on dedicated apps for farmers, contractors, fleet managers and operators. Introduced for 2017, the compact 5R Series tractors from 90 to 125hp feature a one-piece curved frame design with a low centre of gravity and a turning radius of only 3.75m, even when fitted with a front loader such as the new 543R. Features include front axle suspension and an air suspended seat in the newly designed cab, plus an optional cab suspension system. 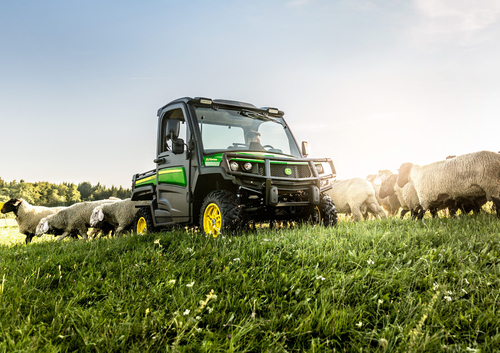 The range’s Stage IIIB 4.5-litre John Deere PWX diesel-only four-cylinder engine produces 10 extra hp for transport applications. Three transmission options include the new 32/16 Command8, with eight powershiftable gears and an ECO mode enabling a top speed of 40kph at only 1759 engine rpm, plus automatic shifting as standard. With a shipping weight of only 4.3 tonnes, the new 5R Series tractors can lift as much as 4.7 or optionally 5.3 tonnes. For front loader operation, there is a choice of mechanical or new E joysticks, both linked to the tractor seat. In addition, the new 543R front loader offers automatic mast and implement latch, a 10 per cent increase in lift capacity, higher breakout force and an increased roll-back angle. John Deere’s new 6250R tractor, featuring the award-winning CommandPRO joystick and an AutoPowr transmission, develops up to 300hp with Intelligent Power Management. It is fitted as standard with JDLink telematics, including remote display access (RDA) and wireless data transfer (WDT) linked to the MyJohnDeere.com website portal. CommandPRO’s functionality allows the tractor to be controlled from top speed to zero with a simple push or pull of the joystick. Both this and the conventional tractor pedals can be operated at the same time, and there is no need for an external ISOBUS joystick as the driver can also operate the tractor and ISOBUS functions simultaneously. With a very light vehicle weight of 9.3 tonnes, the 6250R delivers more power than any other tractor in this weight class, along with an unrivalled power density of 31kg/hp. The high maximum permissible weight of 15 tonnes also allows a 5.7 tonne payload, which means the tractor is able to transport heavier loads. The newly styled Gator XUV 865M utility vehicle features the company’s quietest ever cab, more room for both driver and passengers and an extremely efficient heating system, including a windscreen defrost feature. Equipped with an 854cc, 23hp diesel engine, CVT transmission and power steering plus a top speed of 50kph, the XUV 865M offers a tight turning circle and optimal weight distribution for superior off-road performance. For extra versatility, it can be fitted with a wide range of over 90 attachments from snow blades to winches, and has a large 42-litre fuel tank to keep the vehicle running longer between fill-ups. The adjustable driver’s seat can accommodate three people, for off-road use only. The versatile and durable cargo box has a load capacity of 454kg, while towing capacity has been increased by a third to 907kg and total payload capacity is 680kg. The company’s latest work management apps make it very easy to keep track of machinery, get advice on seed and fertiliser rates or spray requirements and monitor machine productivity by working together with, and being connected to, the dealer, farm adviser and other suppliers. For example, the new MyJobConnect service includes a MyJobsManager app for farm or fleet managers and contractors, and a MyJobs app for operators. There is also an additional app in the MyJobConnect Premium service called MyLogistics, which is an intelligent ag navigation app. Services can be accessed in two ways, either from the office computer or on-the-go using dedicated apps for tablets and smartphones, which allow drivers to view and carry out tasks in real time from their mobile devices. This latest John Deere connectivity package frees up time for farmers and contractors to focus on their core business, and makes the complete work process including job planning, work orders, data recording, customer invoicing and reporting much easier, faster and more efficient.